The jewel of the community, Whistlestop Park and its Depot with gardens carries a certain bit of pride with it as the one focus of the entire community when it comes to restoration. With its beautiful gardens and solid rock foundation, the Depot continues to be a focal point for the community and that’s why it takes the prominent position in the masthead of this website. The little stone depot and the gardens that are the kingpin of Whistlestop Park were almost lost to the community in 1988. Its story before that year and afterward is an interesting one. 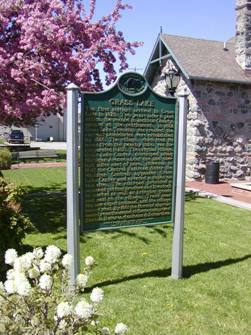 The Central Railroad (later the Michigan Central Rail Road, or MCRR) came through Grass Lake in 1842, and the community’s first depot was built that year. The price per acre for a building site was reportedly $2.00 at the location of Grass Lake Center. A resident one-and-a half miles west offered land for $1.50 an acre and that’s where the new wooden depot was erected! The town of Grass Lake began to grow up around the new depot, and the “old town” was abandoned. Some of the buildings at Grass Lake Center were actually moved to the new town site. Forty years later, the MCRR was replacing many of its old stations. Ann Arbor got an impressive new stone depot in 1886, designed by the Detroit firm of Spier and Rohns, with stone from a quarry at Foster’s Station, northwest of Ann Arbor. The next year, Grass Lake was awarded a stone depot designed by the same architects and with stone from the same quarry – a small version of Ann Arbor’s station! It opened in December 1887. Rail traffic proliferated during the next 50 years. In 1911, 21 trains passed through the Grass Lake area with seven of them making stops. Mail was sorted on board as trains sped through. However, as bus and auto traffic began to prevail, passenger travel declined. By 1929, five trains stopped in Grass Lake; by 1933, three, 1947, two, and just one by 1953. The handwriting was on the wall; the New York Central Railroad (parent of MCRR) began selling off unprofitable stations. Grass Lake’s was put up for sale in 1956 (by then the only train that stopped here had to be flagged) but sat empty until 1962. The price was reported at $5,000, and Robert and Bobby Mather used the building to publish the Grass Lake News. The paper pulled out in 1976, the building was sold, and it again sat empty. In 1980, an arsonist (never actually identified) set fire to the depot, and afterward it existed as a forlorn scorched shell (the roof was removed for safety reasons) for eight more years. Just at the time the village was going to condemn and tear down the eyesore, the Township Supervisor led an effort to get the village to buy the property. The vote was “no”. Phil Willis, who later became the first president of the Whistlestop Park Association, tried to set up an alliance to buy the depot, and at the last minute, he was advised the property had been bought by a developer who was going to build a gas station on part of the property. Luckily for all concerned, that party, Mike McKay was willing to sell enough of the property to allow the depot and a large park to be renovated and developed. Things moved rapidly after that. The Whistlestop Park Association was established and incorporated in October 1988. The deed was signed over in December. The first grant was provided to the organization in February 1989. Volunteers worked on the building for the next three years. A new structure was built inside the remaining stone walls so the old 1887 walls bear no weight but their own. The new interior structure holds up the roof. Luckily, plans of the roof were available so the building could be made to look absolutely authentic. Dedicated volunteers also brought the adjacent park back to life using a plan drafted in 1991. 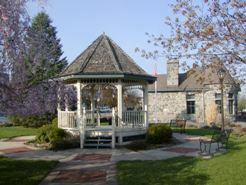 A gazebo was added shortly thereafter as well as an original maintenance shed. The depot was first reopened in 1991 and dedicated in 1992. For the dedication, an AMTRAK train was run from Ann Arbor to Grass Lake to make a special stop here – the first in 36 years. A guest on that train was Maritta Wolff, former Grass Lake resident and author of the novel Whistle Stop while a University of Michigan student in 1940. She lived in California and was invited to come back for the dedication event. Many Grass Lake residents went to Ann Arbor by school bus and rode back on the train with her. The title of Maritta’s novel was the inspiration for naming the organization that owns the depot and park. Heritage Day in September highlights the depot every year with an Open House. We invite the community to be involved with Whistlestop Park, including buying a membership and a brick. The 1887 Michigan Central Rail Road depot is active again. 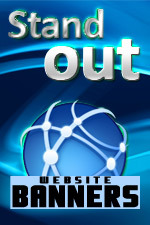 Visit it, use it, and enjoy it! Grass Lake Charter Township in Jackson County Michigan acquired property in 1994 through an acquisition grant from the DNR to be used as public park space. The development of this park has been incremental. Baseball fields and more recently soccer fields have gradually given the park shape and purpose. Active community groups and donors have funded these developments with the oversight of the township board. Donations of labor and materials have also been forthcoming. 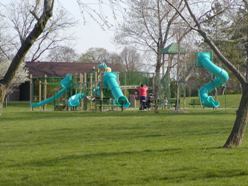 The township board has committed to maintain the park facilities. Bathrooms will be completed in the near future. While all of this development had proceeded, the park still lacked what the community had long requested, the development of walking trails. 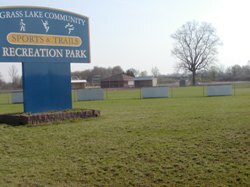 With a grant application this spring the Township sought funds for the development of trails at the Grass Lake Township Park. As a sign of the community’s readiness to proceed, 36% of matching funds were made available in money, labor and materials. The trails would be open to the public dawn to dusk in warmer months for walking and, at certain hours, non-motorized bikes. Winter months the trails would be available for cross country skiing/hiking/snowshoeing. Due to a recent acquisition of 3 acres of donated land, access to the trails would be available from Winegar Rd. and Lakeside Drive. Trail access is currently available from Willis Rd and the parking area. The trails would connect open grassland to forested areas as well as pass over and near the headwaters of the Grand River. The trails would cover 2 miles from start to finish. A 0.63-mile portion of the trails would also be accessible universally. Part of the property that will be used for trails had been farmed in the past but had, in other years, been too wet to farm. Because of the seasonal and unpredictable wetness of a large proportion of the trail property the Township intends to build a boardwalk through these sections. Boardwalk will also reduce the likelihood of small animal/bicycle contact as the animals can pass under the boardwalk when moving from wet to dry ground. The trails would connect the playing fields, allowing parents and friends to walk easily from one game to another. Access to Grass Lake will also be possible which would provide fishing though not swimming opportunities. In addition, the trails system will be beautified by the planting of native grass and flower species in appropriate sites along the trails. These plantings will be funded by separate grants and donations of labor and materials. Because of the variety of terrain the plant types themselves will be various. Bird watching and wildlife viewing in this naturalized landscape will be enhanced. In particular, the bobolink, grasshopper sparrow and Henslow’s sparrow, which do nest in the same geographical area but are rare, would be advantaged. Besides the trails and within the park, the Township proposes adding an area designated for archery practice. This area would be enclosed and away from general traffic, pedestrian and vehicular. This archery range will be a site for education of bow hunters. There is 200 plus acres of pubic land available directly across Michigan Ave. from the park where bow hunting is allowed in season. It is the Township’s expectation that this trails system, which the community has desired and is willing to work to provide, will complete integration of the developed park into an accessible and maintainable public space. One of Jackson County's gems, the Grass Lake County Park on the shores of Grass Lake was remodeled through a joint effort between Jackson County, The Village of Grass Lake and Grass Lake Charter Township during the mid-90's. A new seawall was built along the shore to prevent further erosion on the east side of Grass Lake and new playground equipment, restrooms and concession stand, a covered pavilion, and most recently, a new tennis court gives local residents access to Grass Lake along the southeast shore including a newly remodeled public boat launch. The park becomes the a gathering point for the 4th of July Festivities in Grass Lake each year, and has for the last 26 years, been the site of preference for the annual "Wild One's Regatta" on Grass Lake, bringing a minimum of 125 racers and their racing boats to Grass Lake each year. Sponsored by the Michigan Hydroplane Racing Association, the annual event is held the weekend after Labor Day. In 2009 the National Stock Outboard races were held on Grass Lake and received the "Best Race of 2009" award from the Region 6 Chapter of the American Power Boating Association. Park hours are from 8:00 a.m. to 10:00 p.m. daily. For information on reserving the pavilion for private events, please contact the Jackson County Parks Department at (517) 788-4320. The Park is located on Grass Lake on the North edge of town. From Michigan Avenue downtown, follow Lake Street north from the stoplight downtown directly into the park at the north end of Lake Street.